Mercer’s take on the Chef Knife may prove to be the best budget chefs knife, all-around, if you’re looking for great bang for your buck. It retails for the lowest amount on Amazon, but it packs a lot of features that make this a good choice for not only home cooks but commercial chefs as well. It’s clear that commercial use was in mind when this blade was designed. The handle is rust and stain resistant too, made with a non-slip Santoprene handle that offers surprising comfort. The NSF certification given to this knife adds even more credibility and credence to the commercial design. This knife is bigger than others in our guide, measuring in at 10 inches. The added size is a plus for chefs that can handle it, as a bigger knife means a bigger cutting edge and a larger sweet spot. 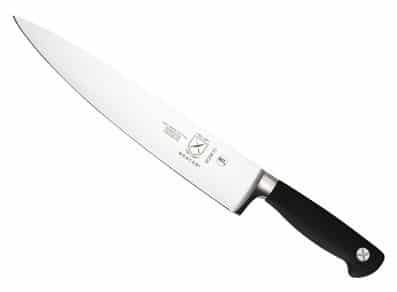 It can make this knife more effective for certain tasks, although not all chefs want or require this large of a blade. The high quality, high-carbon steel used in this blade is surprising considering the price range. The edge holds up fairly well and is sharp enough to handle most jobs. It’s resistant to rust, discoloration, and corrosion. It also cuts pretty well, as you can see from this prep video. Great knife at a great price for home or commercial use. It is comfortable to hold, thanks to the ergonomic handle. The Santoprene offers a solid grip even when wet, and because of the finger-guard you can use this knife with confidence. Santoprene won’t rust or corrode, and it can handle extreme hot or cold temperatures. The large size of the blade makes this blade perfect for chopping or heavy duty prep work. And being two or three inches bigger than your average chefs knife, the increased cutting surface is noticeable and will make some cutting techniques more efficient. The large size of the blade does have a downside. A bigger blade, and therefore larger handle, will obviously weigh more and be harder to balance. This is a big knife that cause some fatigue if you’re not used to working with large knives. Compared to our other budget chef knives, the Mercer Culinary Genesis can be considered a plain-jane in the looks department. It has no discernable visual features and has a lackluster single rivet to accent the handle. Mercer Culinary Genesis 10-Inch Forged Chef’s Knife – The calling card of this knife is the large, robust design. The oversized blade and large handle create a thick, heavy blade well suited to for a long day of chopping. Also, this blade was designed with sanitary purposes in mind. The handle, as well as the blade, are rust and corrosion resistant, perfect for use in a commercial kitchen. Mercer Culinary Genesis 10-Inch Forged Chef’s Knife – Of all the best budget chef knives on our list, the Mercer retails for the least on Amazon. For this reason alone, this is one of the best buys for a budget chefs knife.